Efficiency is key to success in today’s economic conditions. Allocation of resources in an efficient way within the project schedule is a good practice of resource planning. Basically, resource loading , resource levelling and resource smooting are key terms of project resource planning. Project managers and planning engineers usually make safe assumptions on their project’s work schedule. As a result of these assumptions, work schedules often demonstrate more resources than they are needed to complete the project on time. A Resource loaded schedule provides enough information about it’s reality and demonstrates if it is applicable or not. 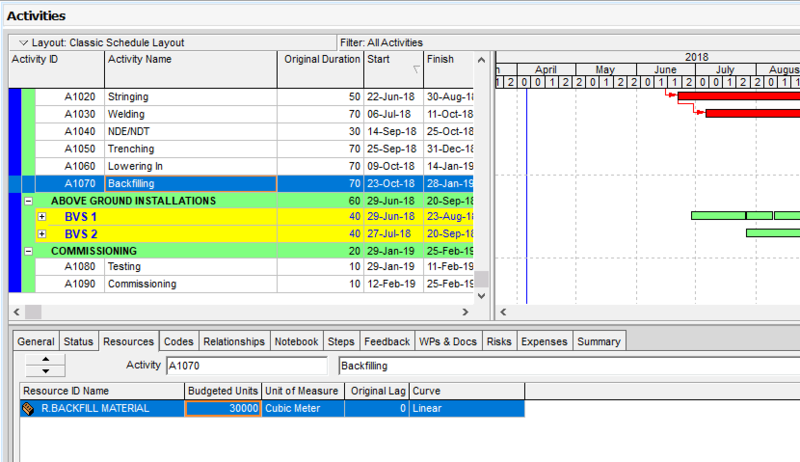 This article discusses the basics of resource loading and demonstrates how to create primavera p6 resource loading spreadsheets. Number of resource loaded schedules are increasing today. Most schedule and cost management systems today rely on the resource loaded schedules because such schedules are capable of providing enough information regarding the targets of a project. Modeling resources is key to success for companies in all types of industries. An integrated resource and schedule system effectively improves the quality of decision making within the organization. Once the work schedule is created and resource estimating process is completed, resource allocation process comes. Resource loading demonstrates the amount of resources distributed in specific time periods. Resource requirements are listed as a function of time period. It provides a general understanding of the amount of resources required to complete the project. For better understanding, let’s review the figure below. This figure demonstrates an example of manhour loading for a housing project. It shows a spreadsheet for the time distributed data of the production work force, week by week. As shown in the figure, total duration of the project is 10 weeks and the workforce is divided into categories. Electrician, Unskilled Labor, Skilled Labor, Foreman and the Mechanic are the manin categories. A stacked bar chart or a histogram can be created to represent the resource loading of the work schedule. 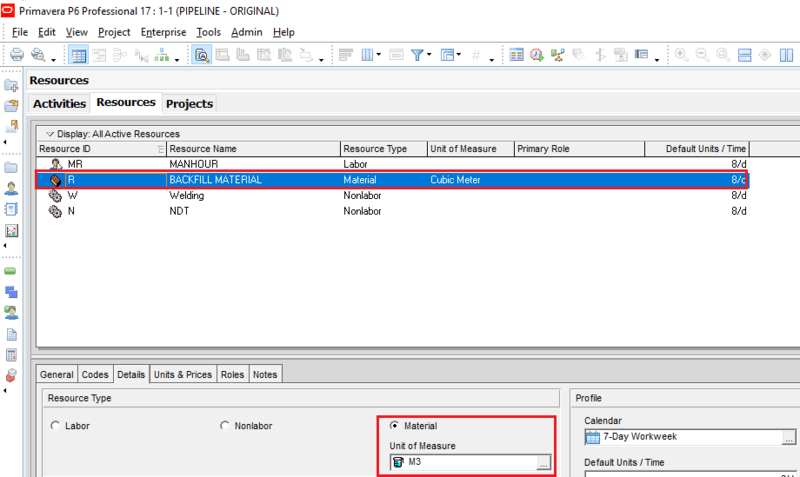 Oracle Primavera P6 Resource Loading feature enables to monitor planned and actual resource quantities. Procurement plans, labor and equipment plans, resource levelling and payment plans can be made by gathering data from the resource loading histograms. Potential risks, unproductiveness and variances can be determined by comparing the planned and the actual figures. The figure below (Figure 1) shows a sample pipeline project. The duration type of the activities is Fixed Duration & Units. First step is to create resources in the Primavera P6 Resources Library and define the units of each resources. Before to create a material resource, define units from Admin | Admin Categories from the main drop down menu at the top of the screen. 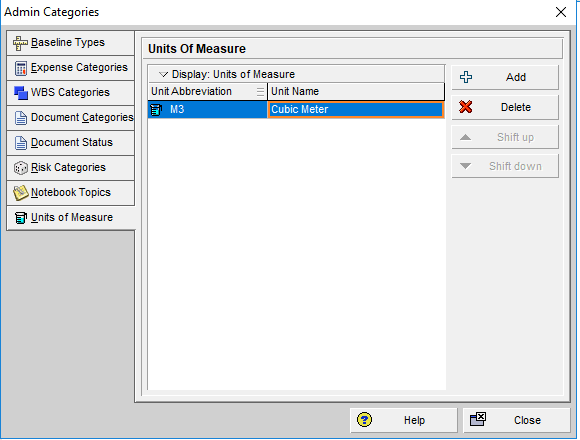 This will display the Admin Categories window then, click Units of Measure tab and add a new unit, Figure 2. Select Enterprise | Resources from the main drop down menu at the top of the screen. This will display the Resources view in the Figure 3. Then click “Add” button and create a material resource. Select M3 for the unit of measure from the Details tab as shown in the Figure 4. Now, assign this newly created Backfill Material resource and insert budgeted quantity for the Backfilling activity as shown in the Figure 5. As shown in the Figure 5, we inserted 30.000 M3 Budgeted unit for the A1070 Backfilling activity . Original lag is used to shift the resource distribution of the activity. It can be either positive or negative. Resource curves are used to represent the resource loading of an activity within the schedule. If you don’t know how to use resource curves, please read this article from here. To show the resource loading of the A1070 Backfilling activity, Select View | Show on Bottom | Resource Usage Spreadsheet from the main drop down menu at the top of the screen. Then, select the resource and customize the spreadsheet by clicking on and select Budgeted Units as shown in the Figure 6. Most of the schedules are not resource loaded. This means that quantities, material and equipment resources are not assigned to the activities. Therefore most of the project managers can not prepare realistic plans due to the lack of information. Resource loaded schedules provide valuable information for the future earnings of projects. Integrating resources, costs, time and schedule improve decision making eliminate problems. A resource loaded schedule is the basis for project control and decision making. In order to monitor the real performance of a project, it must be done well. 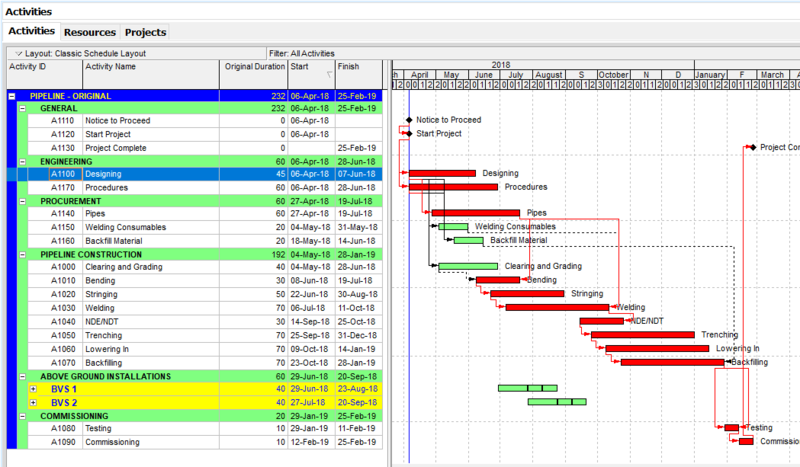 Primavera P6 resource loading spreadsheets and histograms are used to plan and track the resource performance of a project. By the help of Primavera P6 resource loading spreadsheets, resource allocation can be done effectively and resource levelling can be done when needed. Koster, K. (2011). What your schedule isn’t telling you.